Social media is a quickly evolving landscape. New words and terms are creeping into people’s language, and as an effort to resonate better with their audience, brands are also implementing them into their own marketing vocabulary. The outcome, however, isn’t always successful. The implementation of words, abbreviations, and terms have lead to, in the eyes of the customers: silly, embarrassing, and awkward attempts to fit in. In this post, we’re looking at some of the most common social media phrases brands use, and why you shouldn’t use them. This is a word that is used everywhere and by everyone. And as you can imagine, when everyone is using a word of this nature, it loses its true meaning and power. In fact, anyone can call themselves an expert. After all, what is an expert and who decides whether or not you are one? When anyone can give themselves that title, it doesn’t really mean anything, right? If you are using this word, it’s time to drop it. When you use the word expert, people will roll their eyes and say “yeah right”. It is especially embarrassing if you call yourself an expert but still aren’t able to respond to your customers’ questions. These are all “words” that have gained huge traction over the last couple years. A ton of people have started using them, and shortly after, brands have too. The problem is that all of these abbreviations and words are only suitable for extremely few brands’ personalities, that will be able to pull them off. If you aren’t in the second group, (which chances are, you aren’t) you should stay completely away from them without any exceptions. These are terms that are quite bold, and they mostly resonate with people who regularly use a lot of slang and jargon in their language. 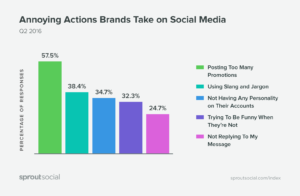 After all, 38,4% of people say that brands using slang and jargon is the most annoying action they take on social media. If it isn’t your brand personality to use slang and jargon, you shouldn’t use it. However, if you are like Wendy, whose audience likes that kind of personality, then absolutely, you should use them. 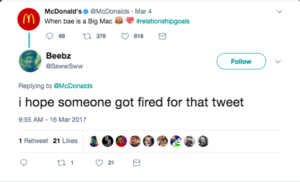 Just look at how people are attacking McDonald’s when they are using the word “Bae”. The bottom line is: don’t use those expressions and be aware of when new expressions aren’t popular anymore. Because they tend to have e a relatively short lifespan. Unless you are changing someone’s life by giving away a car or building someone a house, there’s very little chance that your customer will never have a similar opportunity in the future. In other words, the sentence is most often invalid, because it holds no truth. In addition, the term “once in a lifetime” has been used heavily in marketing, just like “expert” which means that it has lost its power. People no longer take it completely seriously, because they know that it probably isn’t true. Yes, in marketing, it is highly effective to create a sense of urgency, because it plays on humans instincts of being afraid of missing out something. 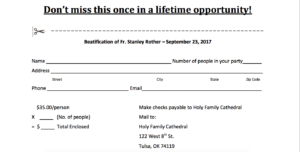 This was a coupon I found where the term was used forepeople to join a trip. And I highly doubt it is once in a lifetime for people to do this trip on their own. But instead of using “once in a lifetime” that isn’t as effective as it once was, try explaining the urgency without using it. For example, writing how much time is left until your sale ends, or how many products you have left is often a more effective way to get your customers to act quickly because it’s more of a proof. Unless you’ve invented the wheel, found a new way to extract energy, or invented the internet, then the chances are that your product isn’t revolutionary. It might be “an industry first” or “unique to the market”, but if that is the case, then us that description instead! When you use “Revolutionary” you put a lot of pressure on your brand, and chances are, you won’t be able to back it up. This means that you’ll lose trust, and leave your customers disappointed. There’s nothing wrong with using the word “revolutionary” in your social media marketing. Just make sure that your product/brand backs it up. Otherwise, you’ll lose trust and credibility if you can’t keep what you promise. This is most often used in customer service and customer interaction occasions. The truth is that this word/sentence shouldn’t necessarily be crossed off the list, but it should be used with thought and caution. Not all brands can pull it off, simply because they don’t have the right personality for it, and most of the encounters I make with brands using it, are brands who shouldn’t be using it. If you know that you use this regularly when interacting with your audience, and know that your audience likes it, then there’s nothing that says that you shouldn’t use it. Be careful. In an article written by Pam, on her blog PamMarketingNut, she writes about how she is tired of lists that tell you which words you should and shouldn’t use on social media (sorry about this article). In the article, she also mentions how people tell her that she shouldn’t use the words “you rock” or “rockstar” (sorry again), and she had a valid point in her arguments. But that’s also why I gave you a second side of the story regarding this word. But in the comment section, people told about their reactions when they see brands using the word “you rock”. and they were proof that it simply isn’t a good selection of words because it makes them tune out. And these are proof to my point! If you have an audience that isn’t going to find your selection of words funny, then don’t use it. But if you know your audience very well, and know they’ll resonate well with it, then don’t let me stand here and tell that you shouldn’t use it. Using a particular language just to fit in is risky. If done correctly, you can gain great results from it, and it can allow you to engage with your audience in a better way. However, there are words and phrases that you simply need to stay away from, because these are either not relevant or not appropriate for brands to use.